Make a bold splash with FIN - your casual beach wear brand for men. “Don´t worry. Everything is going to be amazing”. For the guys with a knack for beach fashion, this island-inspired collection of casual men´s clothes for summer has exactly the laidback clothing style you are looking for. With menswear by FIN you spend the day in the sun and pass every style check. The Bali based label has a fantastic range of beachwear and summer clothing for men to suit every need – from print t-shirts to board shorts and singlets to jeans shorts. Here are some great pieces for every man´s summer outfit and stylish ways to team them for hot days in the sun. Get the covetable FIN´s menswear essentials for your weekend wardrobe now at PASAR. FIN’s beachwear makes style-conscious guys beach-ready this season. For a casual and cool summer style, every fashion victim knows that a good pair of shorts is the cornerstone of men´s clothing essentials. The FIN collection offers a variety of great beach, board and jeans shorts: Not too baggy, perfect length above the knee for a great silhouette. The brand’s fashion line offers a wide choice of mens T-shirts, singlets and shorts to round up your summer looks. Fin luckily is aware: It´s time to throw in some bright bold colors to mens clothing. Their casual menswear comes in refreshing pastel colors, like turquoise, blue, muted pink and maroon reflecting laidback summer mood. Lets the sun shine with banging colors, mixing up orange, yellow and green to their popping tees. 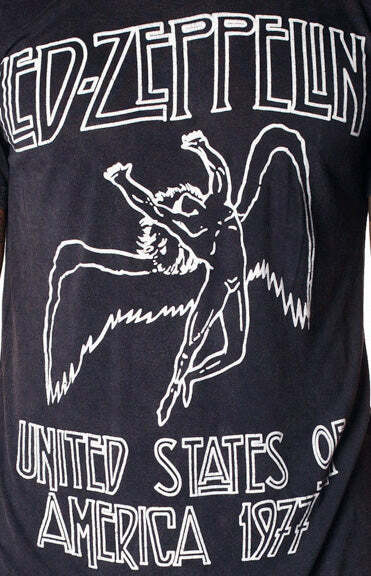 Add a bit of rock n roll to your outfit with Led Zeppelin prints celebrating on of the legendary rock bands of all times. Go with this summer’s trend and brighten up your look with Fin´s popular stripe design. Smart beachwear when the temperature reaches the 20ies: Extremely light and comfortable fabrics made from soft cotton thread and rayon. This is the trademark of FIN’s menswear – perfect for hot days and a casual wear home or away. Signature “Somewhere” fabric style: The FIN designers love going retro and add the beloved used look to their menswear. Fin uses vintage techniques like sand washes, ripped lines and little wholes to give their t-shirts and singlets a worn look.